On the day before Thanksgiving, a bike path several decades in the making opened in Downtown Pittsburgh. The newly completed Mon Wharf switchback connects the Eliza Furnace Trail along Second Avenue and the Three Rivers Heritage Trail on the South Side with the wharf leading to Point State Park. The project is among the last remaining “gaps” in the city’s network of bike and running trails, and is just one part of a larger civic effort to redevelop Pittsburgh’s formerly industrial riverfront property into public space. 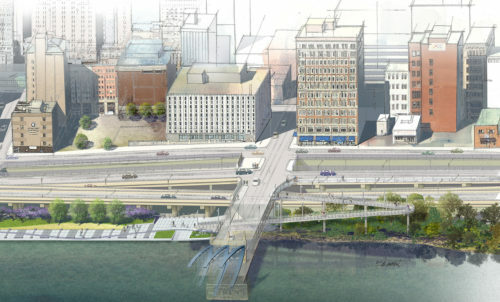 The design and construction of the new connection was the result of a partnership between the city’s Department of Mobility & Infrastructure and the Pittsburgh-based nonprofit Riverlife. “This is about creating access to the riverfront for people not only Downtown but throughout the region,” says Stephan Bontrager, vice president of communications and outreach for Riverlife. Speaking to NEXTpittsburgh, Bontrager explained that such a connection was originally envisioned more than 20 years ago, as civic leaders looked at long-term strategies to revitalize Downtown Pittsburgh. “The actual construction came together in the last eight years,” he says. Altogether, the ramp construction and habitat landscaping cost $3.2 million in both public and private investment. The city hopes to further connect the trails with the 150-mile Great Allegheny Passage which begins in Maryland. Expanding the city’s bike lanes has been a pet project of the Peduto administration, which has installed dozens of miles of new lanes since 2014. The vision is for the city’s bike trails to eventually serve as both an asset for everyday city commuters as well as an attraction for cyclists and trekkers around the region. While the switchback is now open to the public, Bontrager says that this is only the “soft opening.” A ribbon-cutting ceremony with city officials will take place on Tuesday, December 4. While Bontrager is pleased about the city’s zeal and notable progress in developing its riverfronts and trail infrastructure, he says that there are still “important gaps to fill” before cyclists can truly have access to every corner of the city. He pointed to the West End Bridge, upper Strip District and the area behind the Southside Terminal Warehouse as “tricky spots” standing in the way of Riverlife’s broader goal: a 15-mile continuous loop of riverfront trails stretching across Pittsburgh. The Department of Mobility and Infrastructure is currently seeking public input as it updates the city’s larger bike plan. Tell city officials where you want to see more bike lanes here. The post Long-awaited Mon Wharf switchback trail opens, connecting that last gap in Downtown Pittsburgh appeared first on NEXTpittsburgh.